From the roots of our political system in ancient Greece, to the writings of Enlightenment thinkers, to the principles outlined in the Declaration of Independence, America's representative democracy has emerged as a distinct and much debated form of government. In order to best understand this system, it is necessary to comprehend its philosophical roots, historical evolution, and present structure and behavior. 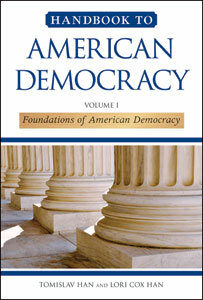 Designed to meet the needs of high school and college students as well as anyone seeking clear explanations of the characteristics and functions of the U.S. government, the new four-volume Handbook to American Democracy provides readers with everything they need to know about the structure and function of American government. Each volume in this comprehensive set is devoted to a major branch of government—executive, legislative, and judicial—and the fourth volume focuses on the ideas and concepts that form the foundations of American democracy. Black-and-white photographs, an index, bibliography, glossary, and box features round out this invaluable set.